This is a really easy no pattern afghan. 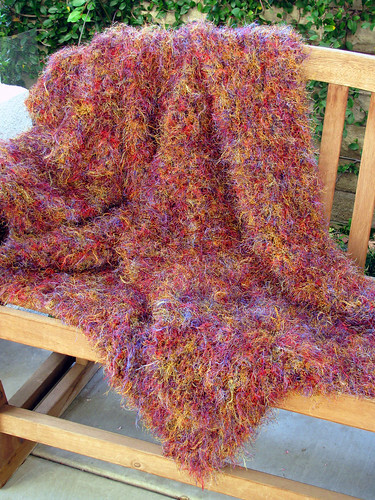 It is just a fun fur type yarn and Lion Brand Homespun. I used Cello and a caramel Homespun. It is all double crochets using a P hook and instead of crocheting in the stitch, it is crocheted in the space between the stitches. So it is super fast. Just buy an equal amount of yardage of each yarn. I think I used 5 homespun and 10 or 11 Cello. Remember that the first chain and next double crochet go in the same stitch to keep the stitch count even. This is a big afghan, 56″ x 76″. I wash it on the easy knit cycle and set the dryer to low heat for about 15 minutes, and if it isn’t quite dry, tumble it on air until it is. It is really a fun afghan to snuggle up under. This entry was posted on Wednesday, December 3rd, 2008 at 3:00 am and is filed under Crochet. Tagged: Afghan, Crochet. You can feed this entry. You can leave a response, or trackback from your own site.